Based in the dark underworld of illegal money lenders and collectors in a violent and deprived fringe of Glasgow society, Malcolm Mackay's book explores the lives of two friends desperate to escape their otherwise futile and depressing lives. Out of work and with few prospects, they start working for one of the players in this dangerous place hoping to move up in the world. But as time goes on, one moves up whilst the other falls out of favour, addicted to a lifestyle of self-destruction with spiralling debts. The Night The Rich Men Burned is, rather unusually, written entirely in the present tense. This fly-on-the wall narrative gives a real sense of what is happening and, more importantly, Mackay fills the descriptions with insights of how the characters are feeling and their reasons for acting the way they do. In a world where status and image matters, these clues help those of us not part of that culture to understand its subtexts and subtleties. This story had a lot of characters - all carefully described in terms of their status and relationships. The character list at the start of the book cleverly reads more like a CV of gangsters rather than simply helping to remember them. Many of the characters are not likeable. They live in the shadows, breeding fear and thriving off the pain they inflict and distress they cause. As they fight for territory and status, and some inevitably don't survive the battles, I was unable to feel pity or concern for them, but remained intrigued as to how it would end. Only a very small handful of characters seem to see and understand the futility of it all and try to make a better life for themselves. But, ultimately, are they destined to be consumed by the darkness or make a break for the light? In this well-written book, Mackay tells a story that starts in a place of desperation and depression, leads us through both hope and hopelessness, through fear and confidence and onto violence, addiction and debt. 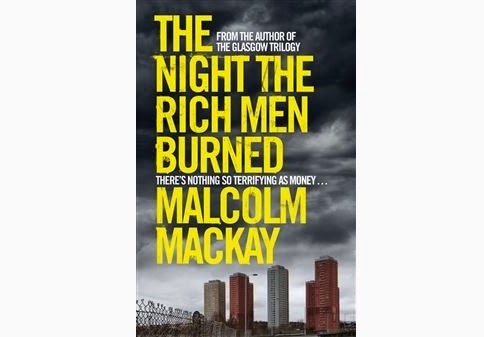 The Night The Rich Men Burned, by Malcolm Mackey is published by PanMacmillan and is available from their website.